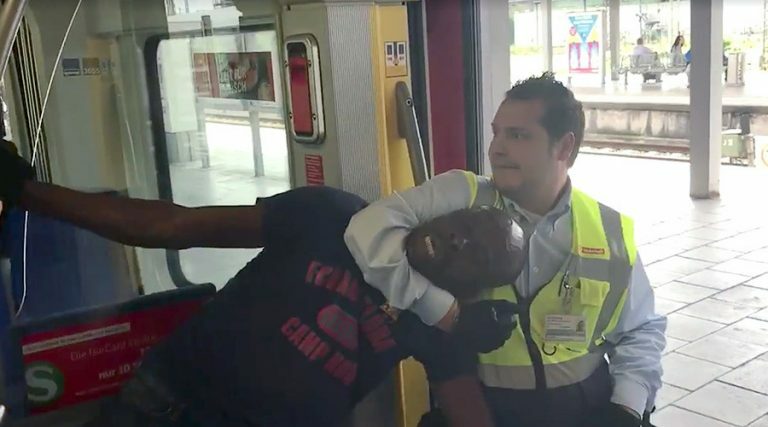 Two ticket Inspectors of the Deutsche Bahn German train system were recently caught on camera savagely dragging the Nigerian man out of a train after he reportedly refused to provide his ID and pay a fine for not having a ticket. The man could be seen vehemently clinging on metal handrails, as two men in uniform ferociously battle to get him out of the suburban S-Bahn train, headed to Munich city center from the airport. "It's absolutely not OK what you're doing, the guy didn't do anything to you. " You should be ashamed of yourself, this is racism what you're doing". "Why are you doing this? He said." The woman continues filming until someone seemingly tries to stop her. The man, said to be a 48-year-old Nigerian, was reportedly removed from the train at Leuchtenbergring station. He appeared to have no valid ticket as the inspectors came up to him during the check. They then asked him to show an ID card and pay a €60 fine ($68), according to the witness who filmed the incident and later described it to HuffingtonPost.de. The man, however, only had €9 in cash, which he reportedly needed for food. The inspectors collected the €9, saying he still owed the rest.